Matt’s 21st birthday is January 12. I wrote the following in the summer of 2014 on a day of his own choosing – his own “coming of age.” I posted it on Facebook then, but thought on this, his 21st birthday, would be an appropriate way to celebrate his very special day. He has been talking about this birthday for about three months! For as long as I can remember, I have put Matt to bed. Leann would gladly do this I know. It has just, for some reason, become a special time for me and Matt and so Matt protects it from outsiders (including MOM). The ritual goes like this: Matt lays down in his bed, I brush his teeth and then cover him up and lay beside him and tell him a story: “Once upon a time there was a SWEEET little boy named Matt Steinhauer – He was the SWEEETEST Little boy! He had a Mom and a dad, and a sister named Kerra and a sister named Lindsay. EVERYBODY loved him! Mom loved him, Dad loved him, Kerra loved him, Lindsay loved him, EVERYBODY loved him. He said again, “I’m a guy, I’m not Little Matt.” I’m “tall Matt.” I confirmed that he was indeed getting tall, and that we really called him “Little Matt” to help people tell the two of us apart. But really it was that I am “Old Matt” and he is “Young Matt” – would that be okay? “Yes!” was his immediate reply. Holding my breath I asked him, “Now that you are “young Matt” and not “little Matt,” do you still want me to tell you a story? Saturday, March 21, 2015, marks the 10th anniversary of “World Down Syndrome Day.” This day was chosen because of the symbolism of the numeric “month/day” as an accurate description of the genetic anomaly of “Trisomy 21” – the occurrence of three chromosomes on what should be the twenty first “pair” of chromosomes. So this extra biochemical matter is the cause of the 16 syndromes that identify Down syndrome. What little boy do you know that on Halloween, dressed in the costume of their favorite superhero, doesn’t literally turn into that character in their own mind? 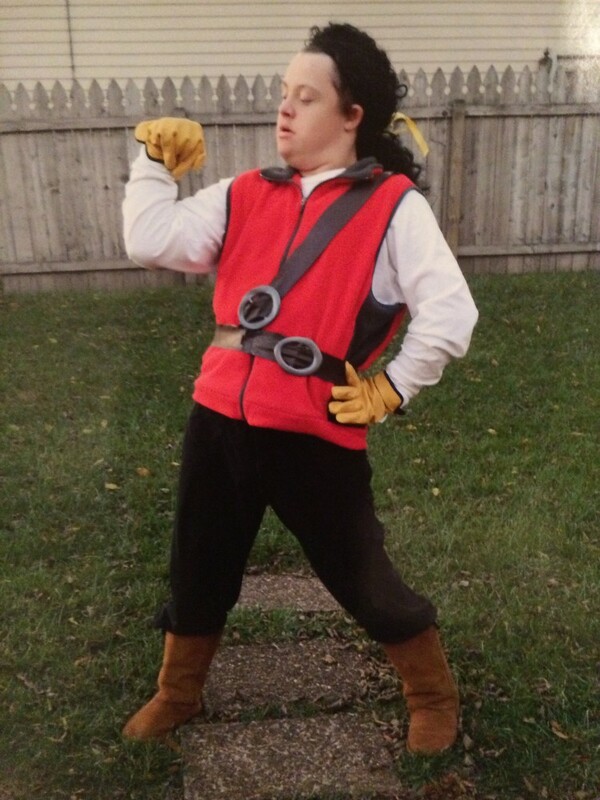 Even though Matt, who was born with Down syndrome, is 20 years old, he still loves to dress up for Halloween (and especially when they have dress-up days in school!). Matt as “Gaston” from Disney’s “Beauty and the Beast” – one of his favorite characters to portray. “No dad. I’m just Matt. A few weeks ago I spent a fair amount of money, and three days of my life, to join 19 other “typically developing” adults in a songwriting and creativity workshop in Nashville. 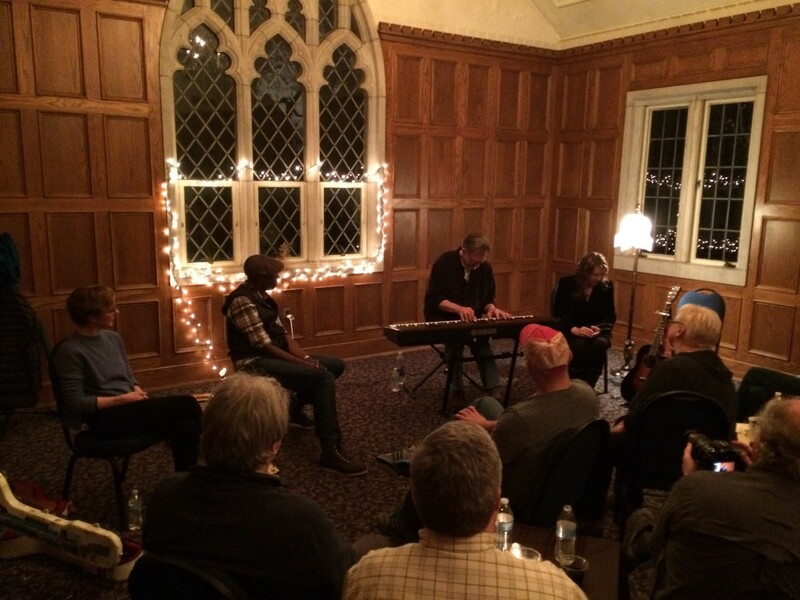 Beth Nielsen Chapman, a gifted singer, songwriter, and teacher, was joined by former All-American and All-Pro football player turned legendary songwriter, Mike Reid, to teach us the most important aspects of the creative arts. On the last day of the workshop we were joined by singer, songwriter, playwright Jonatha Brooke (who added her perspective of creativity), and legendary Americana Blues artist, Keb’ Mo’, who only came to sing, but he also took a few minutes to encourage us in the writing and creative process. “Overwhelming” doesn’t begin to define the creative energy that gathered in a relatively small room that day. If you watch the ABC TV hit, “Nashville,” you have seen the famous “Bluebird Cafe” and know it is a place where some amazingly gifted singer/songwriters show up in a small venue to share their songs and stories. Our small group was treated to a concert by these four legends, any of whom could sell out the Bluebird just about any day of the year. “I’m just Matt!” Matt already grasped this secret of creative geniuses when he was just a boy. He has taught me many things that have been important and helpful for me to know in our relatively few years together. I have living evidence that these beautiful people who are born with an extra chromosome have “extra” other things as well. They have an extra sense of the way things really are. They have an extra ability to speak the honest truth. They have extra vision to see things that “typically developing” people do not see. They have extra compassion and love and an extra willingness to share it. 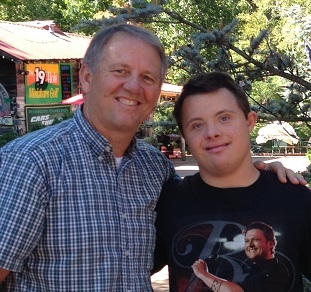 On this 21st day of March, “3/21” — World Down Syndrome Day, I celebrate, and honor, and thank God for my son Matt. Maybe instead of wasting our time figuring out how to stop Trisomy 21 from occurring, humanity would be better served to figure a way to genetically modify all humans’ 21st pair of chromosomes, and add a little “extra” – so that we might experience and share the extra stuff that comes so naturally to Matt and all the other beautiful Down syndrome people in the world. “Just Matt” is what I want to be too. Thank you my extra special son! The longer I live the better I understand that what many of us fear is not the literal darkness of the absence of a light to light our way. If Thoreau were pointing at “superstition” when he brought up the “witches,” I sometimes wish that I could fear the darkness of things that might not actually exist – things about which many folk are “superstitious,” (like I did when I was a little boy going out to get the mail in the mailbox that was only about 100 feet from the front door, but when I turned my back to whatever was out there in the dark behind me it seemed like a quarter mile that I had to scamper to get in the safe of the light of my home), instead of being afraid of the dark – the real dark – that seems to be inhering my world right now. I was going to preach about “light” and “dark” today, on this Winter Solstice, the shortest daylight day of the year. I was already surprised at how much national and global “darkness” I could remind us had occurred in the past four weeks of Advent: two grand jury decisions (and all that transpired because of that), the fears of retaliation by terrorist organizations for the revelation of interrogation practices in the post 9/11 climate in which we live, the threat by North Korea to bomb movie theaters (on Christmas day no less), and 141 children in Pakistan being killed. It just seemed to be “enough” darkness. And then I awoke and read the news that yesterday afternoon two New York City police officers were murdered in their patrol car – most likely as vengeance for the non-indictment of the aforementioned grand jury decisions. Will we ever end the violence and retribution and retaliation? When I got to my church early this morning, I walked into the sanctuary to be sure everything was in place for worship. 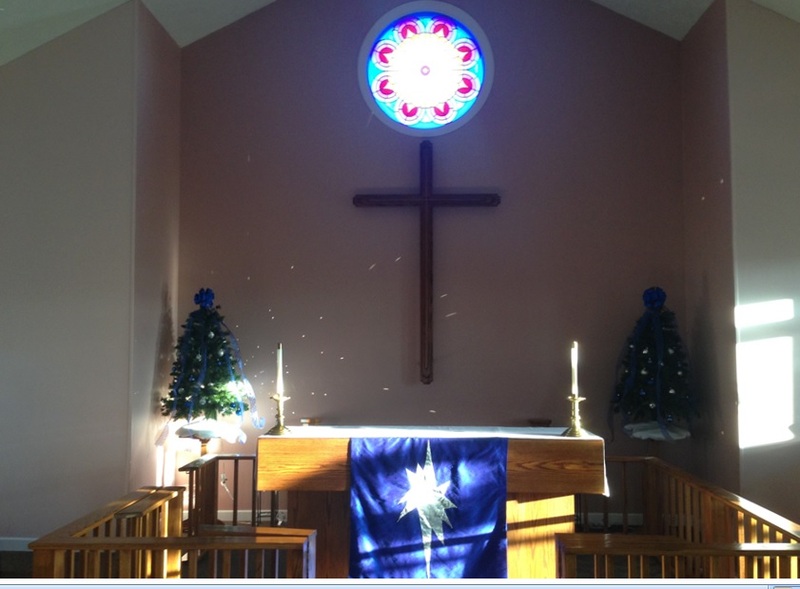 There was a small shaft of sunlight coming through an eastern window and striking a small evergreen tree placed behind our altar as a decoration. It was decorated with blue and silver ribbons and glass balls (in keeping with the liturgical color of “blue” for the season of Advent). I did a double take when I saw little points of light on the wall behind our altar. At first I thought I was seeing stars that someone might have painted on the wall, but then realized it was light reflected off the small mirror ball glass decorations on the tree. On this darkest day of the year, and six months from now – on the brightest day of the year – we can always know that the Light has come. Not just to the good people, or the people who deserve it, or the people who come to church on other days besides Christmas and Easter. It is the light of all people. The light is for you and me and even the people who cause the darkness that we live in. John Mathias Steinhauer, Sr, and John Mathias Steinhauer, Jr., a photo from the Nashville Banner in the 1930’s in an article about President Roosevelt’s March of Dimes Campaign. My grandfather was a Nashville City Police officer and it was only through the generosity of many Nashville residents that knew him that he was able to send his son for care. He started “paying back” the community immediately and to this day my father has worked hard to continue that effort. This is a working copy of a book cover that I hope to publish within the year. My father, John Steinhauer, was born on July 23, 1925. The seventh summer of his life was spent like most of the boys his age who lived in East Nashville: riding bikes through the neighborhood, playing sandlot baseball, swimming in the pool at Shelby Park. Two weeks after his seventh birthday he went for a swim at the pool. The next day he walked out to the car to go to a family picnic and when they got there he wasn’t feeling well. His legs were hurting and he couldn’t walk. His father carried him inside. He would never walk again without crutches or a brace, or without a severe limp. My paternal grandfather died when my dad was still a young man. Fortunately he lived long enough to see that his “crippled” son would do fine in this world. He died not long after my mom and dad were married in June of 1952. John Steinhauer, Jr., with future governor Ned Ray McWhorter. At the time of this photo he was serving as the Assistant Chief Bill Clerk in the Tennessee House of Representatives. He served four terms as a State Legislator and his legislative efforts included procuring a hospital for his growing community, a Community College, and reapportionment of the County Court (county legislative body) for equal representation of a growing county population – that had not been done in decades. I was thinking one day about what a great life my dad has lived, and how I wished his dad could have seen the outcome of his involvement in a variety of places –home, church, serving in elected and appointed positions in state and local government, and at the age of 89 still an active member of The Sertoma Club of Nashville, a civic club he has been a member of for over 60 years. There is a more in-depth story that I am working on, but on this, his 89th birthday, I wanted to tell him “Happy Birthday,” and “thank you” for living an exceptional life and modeling the essence of a “can do” attitude, and especially for leaving some long-lasting and important marks on the world (besides his exceptional children!). Happy Birthday Daddy! You are a hero and example to many! John Mathias Steinhauer, III, and John Mathias Steinhauer, IV – doing our best to carry on the Steinhauer tradition of serving our community! The twenty fir st day of March is “World Down Syndrome Day.” I wasn’t even aware of this annual observance until I saw many posts on Facebook on that day one year ago. I was surprised…but then again I wasn’t, because there are so many aspects of raising a child with Down syndrome that are surprising. This year I am preparing for the celebration and observance by writing this reflection to share with the people whose lives have been so thoroughly enriched by knowing my son, Matt – as well as writing it for those by whom this will be the only way to know such a special and wonderful human being. March 21, or “3/21” is chosen as the date for this event for its numeric symbolism with the genetic mutation that causes Down syndrome (clinically known as “Trisomy Twenty One”) – a third (extra) chromosome on what should be the 21st pair of 23 pairs of chromosomes in every human cell. There is so much to be thankful for, and so many “blessings” that our family has received as the result of having a special-needs child. I have shared, and will continue to share, some of those warm and wonderful stories. But the hard truth is that there are some true challenges too, so I trust you will allow me to speak (every once in a while) these truths even when they are hard. The congregation in which I serve as pastor recently hosted the Ascension Ringers from Augustana College in Rock Island, Illinois. They put on an amazing bell choir concert for no more than a “free will” offering. In return, as is the custom when a congregation hosts one of these traveling college groups, our family was responsible for overnight housing of some of the college students – in our case, three young men. After the concert I loaded the boys and their luggage in my car and drove them to my home, where my sweet and hospitable wife, Leann, had prepared some late night snacks. We were standing around the island in our kitchen, engaging in conversation about their hometowns, why they decided to join the bell choir – the normal type of conversation one might expect to have with three young men we had just met and would probably never see again. Matt, who usually stays put in his “man cave” (in the bonus room up the stairs) where he sits on the floor surrounded by his four cowboy hats (a white one for Brad Paisley, brown for Blake Shelton, black and a summer “straw” version for Kenny Chesney) and a couple dozen pictures of his favorite stars, with his headphones on and iPod playing music (listening to Blake, Brad or Kenny), was honoring our guests with his presence in the kitchen. But I know he was mostly there because among the snacks was a pizza set out on the kitchen island and he had high hopes that “the boys” might include him in sharing one of his favorite foods – and they did. I looked up – we ALL looked up – nothing. A few minutes later, when we decided it might be time to head to bed, I noticed a very large puddle of water on the floor where there should be no water…and then realized there was another puddle on the counter under the coffeemaker I had just setup to go off the next morning. I had not firmly plugged the coffee water reservoir into place, so the water that should have drained into the coffee maker the next morning all went on the floor – drip by drip – over the edge of the counter in a silent and out-of-the-line-of-sight manner, until it had collected in a large puddle on our kitchen floor. There really was something going on here that was going to need our attention. We just didn’t see it until we were right beside it. If you know somebody with a Down syndrome child, this might be sort of like their life. 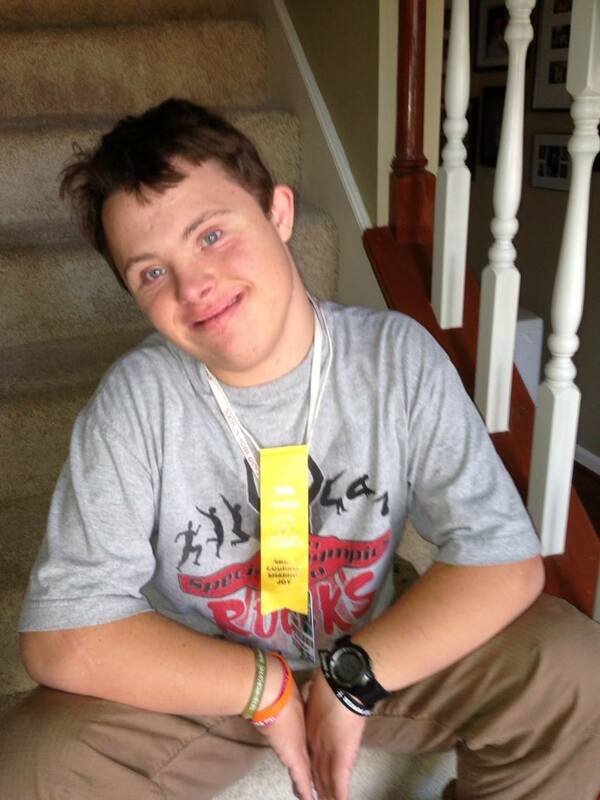 Our initial “the roof is leaking” call-to-attention came when we got the news that our child had Down syndrome. Some Down syndrome children have significant health and medical issues from the get-go, with heart defects and other situations that require surgeries – and sometimes several surgeries – to start their lives. Matt’s start was pretty much like any other newborn. He didn’t have the additional medical issues to compound the already “big surprise.” We started looking for the “problem” the doctor had told us we had, and we just didn’t see it. Our baby looked a little different and was slower than his older sisters in the “firsts” that parents count with their children: first time to roll over, first time to sit up, first time to crawl, first words, first steps, but for the most part he was just a baby – a sweet, good-natured, very easy to love little boy. Maybe the “warning” should be heard as a prophecy instead of a pronouncement. The roof may not be leaking, but if there is water on the floor that is not supposed to be there one is eventually going to have to deal with it. Just when we thought we were going to bed and get a good night’s sleep we had to start dealing with a situation that we had been warned of, but really didn’t quite comprehend. For Leann and I living into some of the challenges of parenting a special needs child has been long coming, and this is one of the challenges for every parent of a special needs child. Those babies…then children…then adolescents…then teenagers…grow into adults. They will graduate from high school like typically developing children, only they will not go on to college, and then get a job, and then move out on their own. Matt will graduate from high school…and then he will be a full grown adult, dependent on us for as long as we feel like that living arrangement is appropriate. As a brief “aside” I need to offer this word of advice to parents of “typically developing” children who seem to have this particular trait of Down syndrome children (graduating from high school/college and seeming to become an adult dependent). Please don’t have your child genetically tested for Down Syndrome. Some of the best and brightest young adults wind up as “adult dependents” for a season. You will be wasting your money and it might come across as disrespectful to your child if you suggest to them that they have this “syndrome” in common with Downs children and that you think they need to be tested!). Our first two children are grown and gone. One-by-one our friends become “empty nesters” and gain the flexibility to come and go on a whim — do whatever they want to do with their time. We turn toward our “retirement” and there greeting us is this puddle of water that we just didn’t see, or didn’t see growing from a steady drip into a puddle, or maybe we were so busy with all the other aspects of raising a special needs child we hadn’t come up for air long enough to even wonder this far ahead. 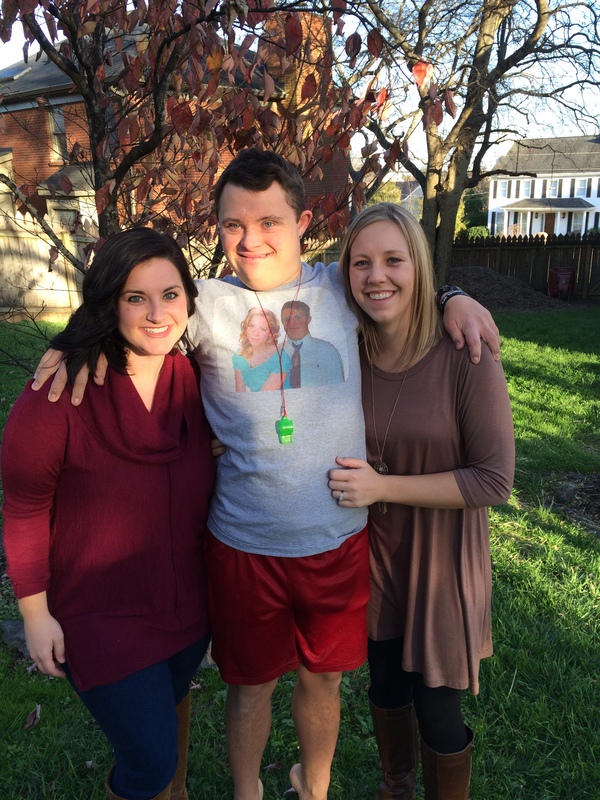 The challenges of raising a special-needs child are often life-long. Remember that among all the cuddly and cute stories and pictures and anecdotes that we parents share about our children, we also face heart-breaking realities. Most of us, given the chance to “do it all over again,” would indeed “do it all over again” – without even thinking about it. But that is only because the gifts that we receive and the lessons we learn from our special children far outweigh the challenges and hardships. But the challenges and hardships exist nonetheless.